I like a good scare. Heart-pumping, goosebump-inducing experiences make me feel alive, especially during the Halloween season. I’m no ’fraidy cat, but do admit there is safety in numbers. So, in autumn, I gathered the fearless among my friends to explore the spirited side of St. Louis. We set the fright-filled tone of the trip by first visiting the Scarefest trio of haunted attractions—The Darkness Haunted House, Creepyworld Haunted Screampark and the Lemp Brewery. 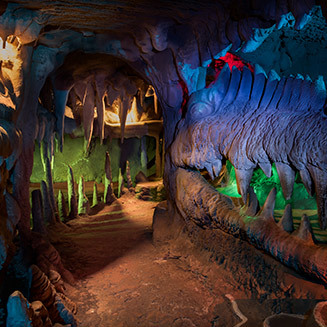 These magnificently crafted, high-tech haunts are nationally recognized for maximum fear-inducing fun. I equate the experience to being the star of my own live horror movie. These triumvirate of terror sites tick off all the haunted house boxes from things that go bump in the night, freakish clowns, salivating monsters, haunted graveyards and, of course, hordes of the undead greeting you at every apocalyptic turn. Welcome to your wide-awake nightmare! It’s a well-known fact that Halloween also is zombie-hunting season. At the Zombie Xtraction Laser Tag arena at The Darkness Haunted House, my group makes it safer for humanity by strapping on laser blasters to seek out the “live” undead who haunt this dusky, labyrinthine zombie land. The unhappy hunting grounds are located in the Soulard neighborhood just south of the Gateway Arch. No hunting permits necessary, but reservations are required. After depleting the zombie population (you’re welcome), we opt for a more cerebral scare, choosing one of the three dramatic, realistic escape rooms at The Darkness. The heart-pounding pressure was on when we teamed up to beat the clock to defuse the ticking bomb on a runaway subway train. Two of our cohorts relished the nervous pit-of-the-stomach pangs that accompanied their attempt to break out of the sand-and-sarcophagi-filled Mummy’s Tomb. None of us dared step into the serial killer’s lair! Post-Halloween bonus: the escape rooms are open all year long. After the escape rooms, my friends and I decided we were ready for the experts to lead us down some creepy paths. St. Louis Haunted History Tour can help anyone experience the scary side of St. Louis during a ghost story-filled walk through historic Laclede’s Landing and the Gateway Arch grounds. The St. Louis Paranormal Research Society takes its spookiness seriously. Its investigators guided us through the historic Lemp Mansion, designated one of the Top 10 authentic haunted houses in the country by Life magazine back in 1980. This south city home, where spirits of the ill-fated Lemp brewing family are said to walk the halls, has been featured on ghost-hunting TV shows. Not only can you ghost bust in the 1868 home, you can sleep over, too! Overnight accommodations are available for those who dare to hold an eerie PJ party. If you like to giggle with ghosts, treat yourself to one the mansion’s funny participatory mystery dinner shows. Lemp Mansion Paranormal Tours are scheduled every Monday night throughout the year and more often during the haunting season. St. Louis’ oldest remaining home, the 1820s Bissell Mansion, also touts a resident ghost and serves up dinner with a side of mirth during Murder Mystery Dinner Theatre productions. As a kid, I had been terrified by the cultural phenomenon of The Exorcist book and movie, but I didn’t know the real story of the possessed child actually took place in St. Louis at the old Alexian Brothers Hospital. The rite was performed by priests from Saint Louis University who didn’t talk about their part in the struggle for many decades. The popular version’s young girl was actually a boy brought from Maryland to live with relatives in North St. Louis County and be cared for by the Jesuit fathers. We visited the remains of the old hospital’s burned chapel cross that, the story goes, was struck by lightning when the exorcism took place. It’s on display at ever-innovative City Museum in downtown St. Louis. There’s no business like boo business. 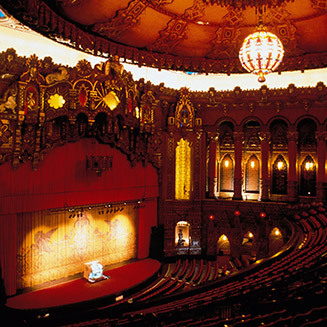 Ghosts take center stage during tours of two of St. Louis’ historic theaters: The Fabulous Fox Theatre and the Peabody Opera House. While taking the Fox Theatre tour, we learned that the specter of a stagehand still watches out for the magnificent theater, where touring Broadway musicals delight crowds throughout the year. Fabulous Fox tours are available year round while the Peabody Opera House spills its spooky stories for groups by reservation. Halloween treats make enduring tricks all the sweeter. After a few fright-filled days, we always reward ourselves with one of the best seasonal treats in town—a Pumpkincrete from Ted Drewes’ Frozen Custard. This landmark custard stand is an icon along the original Route 66 and a St. Louis institution known for a “concrete,” a milkshake so thick you can turn it upside down without spilling a delicious drop. The Pumpkincrete vanilla custard is served with a slice of pumpkin pie and topped with whipped cream and a nutmeg dusting. Halloween brings out the kid in me and St. Louis serves up some not-so-frightening stuff to do. We went buggy at the Saint Louis Zoo’s Insectarium, where more than 100 species of live, creepy crawly insects reside. The Zoo’s Herpetarium houses enough slithery snakes and reptiles to make Indiana Jones quake. The Penguin and Puffin Coast habitat is sure to give you chills—caused by its cool temps, not the cute resident critters. Special Halloween events are scheduled throughout the haunt season, including the popular Boo at the Zoo events. Little folks who tagged along with us also had a fright-free Halloween experience at The Not-So-Haunted House at The Magic House, St. Louis Children’s Museum. 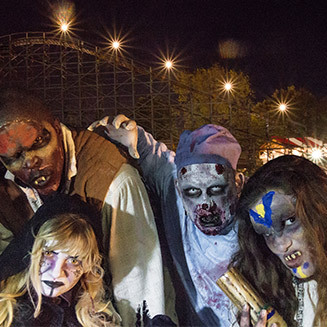 Book your visit over an October weekend to experience the free, kid-centric Grant’s Farm Halloween Celebration or get spooked at Six Flags St. Louis’ Fright Fest, where we whooped it up on heart-pounding rides and rollercoasters in the theme park transformed by monster-sized decor. Tombstones are an iconic Halloween symbol. We discovered an amazing array of funerary monuments and cemetery architecture at St. Louis’ historic Bellefontaine Cemetery. Complimentary tours of the beautiful cemetery showcase the final resting places of fur traders, river pilots, Civil War veterans and famous St. Louisans, including explorer William Clark and beer barons such as Adolphus Busch and the aforementioned Lemps. So, this Halloween, head to St. Louis. You’re sure to have a boo-tiful time. Don’t miss the best 25 things to do in St. Louis while you’re in town.